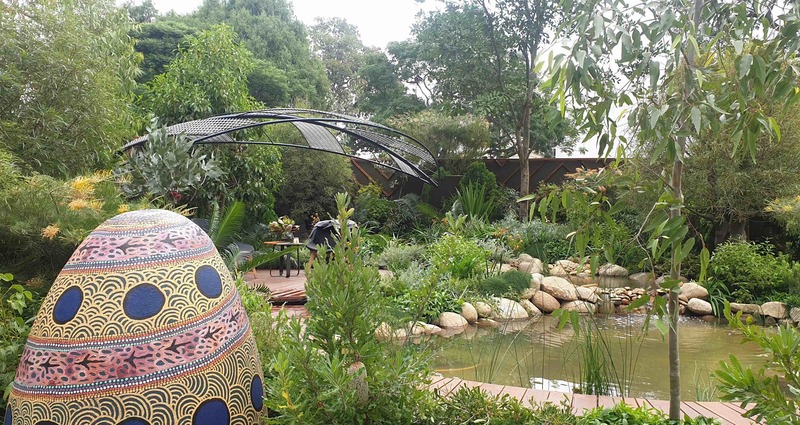 Over the last few years Botanix Plant Supply has been proud to supply high quality trees and shrubs for a number of award-winning display gardens at the Melbourne International Flower & Garden Show. For the 2019 Show our plants were featured in all categories; show gardens, boutique gardens and within the Avenue of Achievable Gardens for up-and-coming horticultural students. This year a distinct trend emerged of mixing Australian natives, succulents and Mediterranean style plants to great effect. It was notable in just how many gardens this combination was seen to be working well. This palette emphasizes the movement towards a softer, sustainable approach in our gardens, with a better appreciation of our Australian climate and way of life. Highlights of silver foliage also made an impression. Our Eremophila nivea ‘Blue Velvet’ and advanced Eucalyptus cinereal ‘Silver Shadow’ were popular, along with our sculptural Xanthorrea gluca. Large architectural plants also became a centerpiece in many gardens. Botanix supplied advanced cloud pruned olives to both Bonnie Thexton and Robbie Mcnab, who created wonderful gardens in the Emerging Designer Category. It is great to see these plants given such emphasis. Semi-advanced Bottle Trees with character were also on display in Christian Jenkins’ Silver Guilt winning show garden ‘Dreaming’. His garden was a true celebration of Australia’s diverse range of plants. 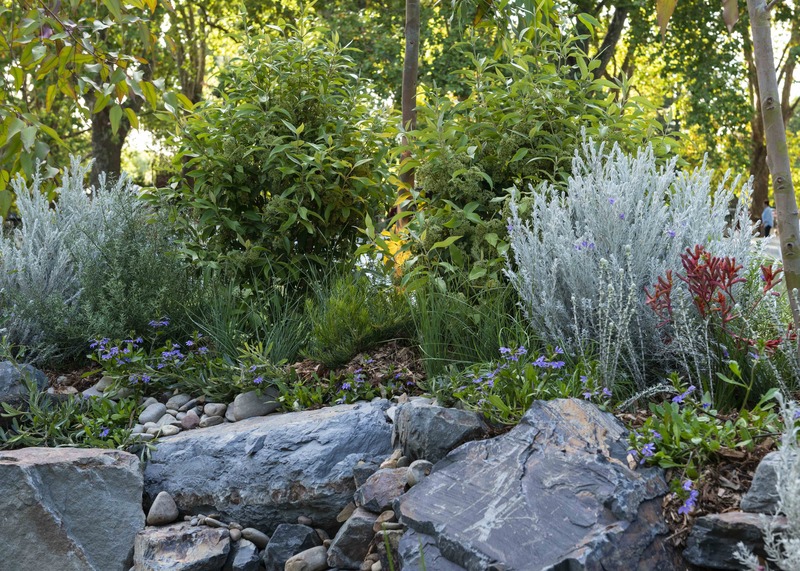 Ben Hutchinson also used an eclectic native palette which incorported our Lemon Myrtle, Banksia and Eremophila in his bronze medal winning garden ‘Urban Retreat’. MIFGS presents a number of challenges for designers – how to make a temporary show garden feel like an established landscape. All designers achieved this to great effect. One way of creating the impression of a full and settled garden and is through the use of mature and larger sized plants. With an increase in our 30cm range over the last year we were able to supply effective underplanting specimens in a size allowing for that an instant impact. Good examples of plants which can be used in this way are Banksia cultivars, such as ‘Birthday Candles’, as well as ‘Pygmy Possum, which were on display at MIFGS, along with examples of Casuarina ‘Cousin It’ which could seen cascading over rocks. Botanix Plant Supply would again like to congratulate all participants in another successful Melbourne International Flower & Garden Show. In 2019, Botanix Plant Suppy is excited to announce the further expansion of production facilities at our Carrum Downs nursery. Construction has begun on a dedicated area to boost production in our 70L containerised range. This size has proven extremely popular with the landscape market, both in screening plants such as Laurus, Acmena, Elaeocarpus and Waterhousia, and also with specimen trees such as Acer, Lagerstroemia and Quercus. One great attraction is that trees and shrubs grown in 70L pots are of an equivalent size to those grown in 100L containers, while being produced at a much more competitive price. On landscape sites, the 70L pot size provides a number of other significant advantages over larger containers. Importantly, the reduced weight increases manuevrability, with dedicated handles further assisting in easy placement by two people. This represents a true improvement in OH&S outcomes. Critically, there may also a reduced reliance on machinery, which is a real benefit for tight-access construction sites. This 70L size is also suited for narrow planting situations including along boundaries or other limited access areas, where larger scale screening is still required. With an extensive range, Boxtanixe has become a trusted supplier to both domestic and commercial landscapers – landscape architects and designers as well as developers.